Action feature: "Tracking Specialist" with Capture Pack & Brachiosaurus Hatchling. 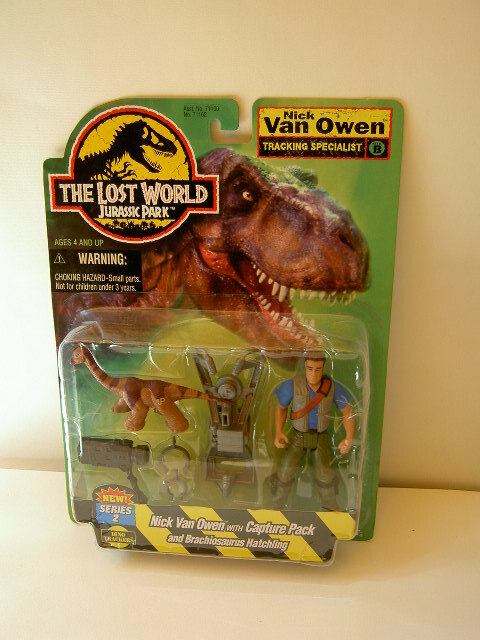 Description: this Nick van Owen figure stands in a somewhat more active posture than his TLWS1 predecessor. He stands with his left leg moved backward and his right leg forward, while his left hand is closed in a fist. Nick’s arms look pretty muscular, especially his upper arms. Though it’s a matter of millimetres, this figure is one of the tallest figures of all JP toy lines. Nick sports a blue shirt, covered with a grey vest adorned with a total of four pockets. A belt runs over his torso, orange on the front part of the figure, and black on the other side. Nick wears green pants, covered with several pockets of the same colour. Additionally, he has a black belt around his waist and two smaller black belts around each lower leg with additional pockets, probably used for carrying video cassettes or other equipment for Nick’s camera. Van Owen sports rather odd shoes, coloured orange with a silver metal frame around it, as if they’re enhanced for use in rough terrain. Unlike the TLWS1 Nick, this figure sports brown hair, including his eyebrows. Nick comes with various pieces of equipment. First, being a documentary film maker, he has a large black camera, which can rest on his right shoulder while he holds it with his right hand (his other hand can’t hold anything). The camera looks more realistic than the camera the TLWS1 Nick came with (if that was indeed a camera). There’s a hole in the camera, so you can look right through it, seeing what the camera is “filming”. A second tool Nick comes with is the catcher pack: this odd looking metallic grey device can be attached around the figure’s waist so he can carry it. It looks pretty sophisticated with its elaborate mechanical detailing, but it doesn’t really have any action figures unlike one would expect. However, there’s a small box on top of the device that can be opened: it reveals what appears to be a piece of meat, coloured brown with a small white bone sticking out of it. Being a vegetarian I won’t try to classify it, because I’m bound to get it wrong. It seems the catcher pack is just a method of luring dinosaurs towards Nick, so he can film them, and if necessary, catch them. Given the fact that this figure also comes with two small pieces of capture gear (namely the typical “handcuffs” many sets of capture gear have featured since the JPS2 toy line), the latter option seems a logical course of action. Strangely enough, Nick comes with a herbivorous hatchling, so it seems odd it would be attracted to the catcher pack’s meat. The hatchling is labelled a Brachiosaurus, though it looks a lot different than the JPS1/2 Brachiosaurus hatchlings or the Sauropods seen in the first JP movie. The hatchling measures some seven centimetres in length, and sports a light brown paint job, adorned with purple spots on its snout, neck, back and tail. It has small black eyes and a beige JP: Site B logo on its left hind leg. Most notable, it has very plump thick legs, making it seems rather disproportionate and even a bit silly. Analysis: this third Nick van Owen figure (next to the TLWS1 Nick and the exclusive High Hide Nick) isn’t much of an improvement and has some pros and cons. The pros are found mostly in Nick himself. 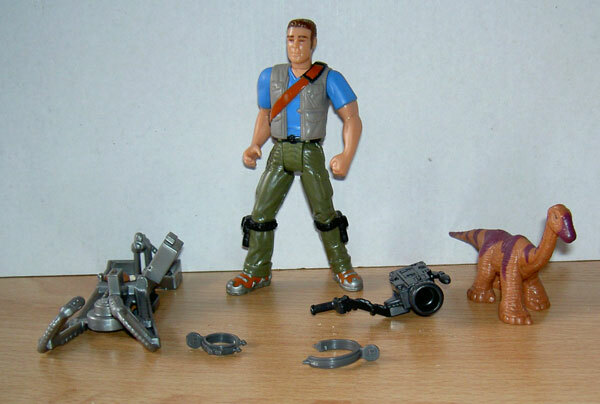 Though it’s not identical to the garment Vince Vaughn wore in the TLW movie, this figure’s clothes, including their paint job, are more similar than the outfits of the other Van Owen figures. This excludes the shoes, since they’re really quite strange and I’m positive they weren’t featured in the film. It’s obvious the designers of this figure wanted to establish Nick’s status as a film maker more clearly, something the other Nick figures lacked. Nick comes with a relatively realistic camera (by toy standards of course), as well as loads of pockets for carrying video equipment, most notably the ones on his legs. Though the camera doesn’t provide for any action, which can be said for the entire figure by the way, it’s a fun gadget. The same cannot be said for the catcher pack, which is plain boring. It looks way more elaborate and detailed than is necessary, considering it doesn’t do anything at all. The only option it features is the small box with the meat in it, but having designed a smaller piece of equipment carrying only this box would have sufficed. Now Nick is forced to wear this large piece of plastic on his back, and given the fact it hangs pretty loose and occasionally even falls off because it’s out of balance when attached to the figure, it’s downright annoying. The Brachiosaurus is quite cute, but doesn’t look much like a Brachiosaurus at all. Though its large legs make sure the little beast doesn’t fall down, and also make it hard to knock over using missile launchers of other figures, they make the poor creature look very weird. The paint job isn’t bad, though like with most hatchlings it’s lacking detail. The two pieces of capture gear can be attached to the Sauropod’s legs and body, though it’s doubtful they would restrain it in real life. Playability: not very high. Though Nick has poseable arms, legs and head, it’s quite vexing he can’t hold stuff with his left hand since it’s closed to a fist. Like stated above, the catcher pack doesn’t provide for much action at all. The same is true for the camera, though it does give Nick more character and looks pretty butch on his shoulder. The Brachiosaurus doesn’t have any poseable body parts, like all the other TLW hatchling figures. Realism: the figure’s head sculpt looks a lot like Vince Vaughn’s head, though less detailed (it’s a toy version of him after all). 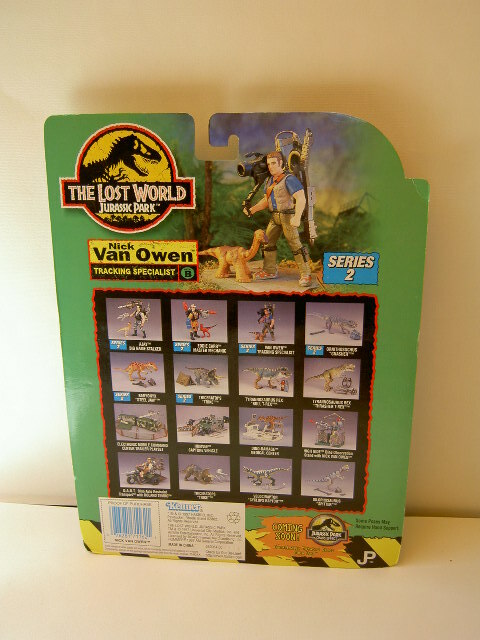 However, this figure makes Van Owen appear more muscular than he looked in the movie. His clothes are not that different from the outfit Nick sported in the movie, though they’re not an exact copy. Since Nick was established to be a documentary film maker in the movie, it’s nice to finally see him running around with a real camera. The catcher pack was never seen in the movie, which isn’t a great loss. 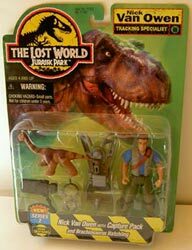 There were no Brachiosaurs in the TLW movie, though they did appear in the first JP and eventually also JP III. In neither film did they resemble this particular Sauropod. For one thing, they had thinner legs, a shorter tail and a different colour pattern. Also, their heads looked a lot different from this one’s, with a large bump on the forehead carrying the nostrils. This Brachiosaurus looks more like a Diplodocus, judging from the shape of its head. But due to the disproportionately large legs, it looks even more like a made up dinosaur. Repaint: no. This figure, as well as all its accessories, would not be repainted for later toy lines either. Overall rating: 6/10. Though the figure itself is quite good, the catcher pack and the hatchling aren’t very appealing. They just don’t look interesting, nor do they provide for any action features. Additionally, this sculpt is one of the rarest TLW figures and as such is quite hard to find, usually fetching pretty high prices. Be sure you really want one before you spent too much cash on it, because it may not prove to be worth it.